Acknowledged author James W. Kalat wrote Biological Psychology comprising 624 pages back in 2018. Textbook and etextbook are published under ISBN 1337408204 and 9781337408202. 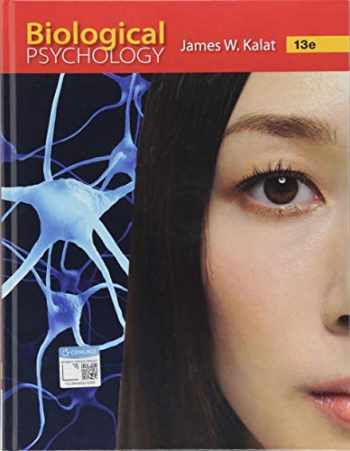 Since then Biological Psychology textbook received total rating of 4 stars and was available to sell back to BooksRun online for the top buyback price of $79.44 or rent at the marketplace. The most widely used text in its course area, James W. Kalat's BIOLOGICAL PSYCHOLOGY has appealed to thousands of students before you. Why? Kalat's main goal is to make Biological Psychology understandable to Psychology students, not just to Biology majors and pre meds--and he delivers. Another goal is to convey the excitement of the search for biological explanations of behavior. Kalat believes that Biological Psychology is "the most interesting topic in the world," and this text convinces many students--and maybe you, too--with clear writing, amusing anecdotes and intriguing examples. MindTap, an interactive online learning resource that integrates the text with videos, animations and a virtual bio-lab component, makes learning even easier and more enjoyable.